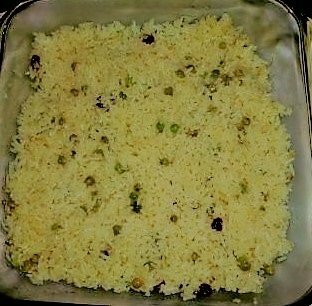 Among different type of pulao (a type of fried rice) recipes, green peas pulao recipe is more popular. Usually, green peas are used for two reasons: one, green peas fry is a very tasty element that increases the taste of pulao and secondly, peas makes the decoration of the fried rice. Like many other pulao, this fried rice makes healthier food and looks attractive. My kids like green peas so much, so I have to cook this pulao in the season of green peas. Fresh green peas is good for this recipe. Green peas are available in Bangladesh in December. Pulao is similar to fried rice, the difference between pulao and fried rice is cooking process. 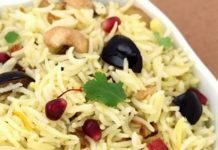 In Bangladesh, India, and Pakistan it is customary to serve pulao along with a special menu to new guests or during any special occasion. There are special qualities of rice, mostly miniature are used for cooking pulao. While peas are mixed to bring the difference in the taste of pulao, you can also use other vegetables and fried onions to make the pulao more presentable. The process of cooking of green peas pulao is easy if you are aware of the recipe. Like all other pulao, the rice needs to be half fried. Here, green peas are also half fried with rice. Then the rice and green peas mixed are cooked with the spices. If you want to eat good fried rice, just try it today! Wash rice and then drain out water. Keep aside. Put oil in a nonstick deep pan over medium heat. Add onion slice to the oil and fry until golden brown. Before taking out the onion from the oil add 1 tsp sugar to the fried onion. It will help for keeping crispiness of onion. We called this fried onion is “Beresta”. Keep it aside for cooling. After cooling, the fried onion becomes crispy. Add ghee in a pan over the medium heat. After 1-2 minutes add ginger paste and bay leaves. Then add rice and green peas and stir slowly. Cook (fry) the rice and peas mixture for 2 minutes. Add water (double quantity of rice and green peas). Cover with a lid over high heat. After 10 minutes, add rest of sugar to the rice. After 15 minutes, dim the burner. Take off pulao from the burner to a serving dish, when water is dried up. Green peas pulao is ready to eat. Before serving the pulao spread the beresta over the peas pulao. Serve this pulao with any kind of meat or any special fish item or vegetable item. If you like my green peas pulao recipe please share this recipe with your family and friends.